How does the ability to do phagocytosis of a new cell population compare to other dendritic cells? The intestines are home to immune system cells whose role is to monitor the microbiota within the gut; one group of these cells being dendritic cells. Recently, a population of dendritic cells that are CD14+, a marker that was associated with macrophages, were found in the colon. The role of these CD14+ DCs in the colon and their ability to do phagocytosis is unknown. We hypothesize that that these novel CD14+ DCs will be better at phagocytosis compared to other DCs. We extracted cells from the colon and incubated them with a pseudopathogen with a colored marker under multiple different conditions. Afterwards the cells were stained with antibodies and analyzed using a flow cytometer. Under multiple conditions, we found a higher median fluorescence for the novel DCs when compared to the other DCs in the colon. At the same time, the novel DCs did not have a median fluorescence intensity as high as the macrophages. Our data suggests that the novels DCs have an increased ability to perform phagocytosis compared to other DCs but not at the level of the macrophages. Sea Urchins, Baboons and Mice, Oh My! Over the past week, myself and other members of the BSURF program had to give chalk talks; 8-minute talks about our project with nothing but a whiteboard and a marker. Even though I was nervous about giving my talk, I was looking forward to the talks. I had previously talked to some of the other students about their projects, but I wanted to know more about everyone’s project. Hearing about the diverse research opportunities gave me the opportunity to expand my knowledge on topics including Alzheimer’s and sea urchin embryos. One talk that I found fascinating was entitled “Neural Circuitry for Vocalization in Mice”. The chalk talk was given by Alina Xiao, who is working in the Mooney Lab. Her project involves looking at a specific area in the brain to see if it is activated when male mice vocalize, whether it be for defense purposes or courtship. The project got my attention because humans vocalize all the time, yet I rarely think about how and why other animals vocalize. Seeing how mice use this trait compared to humans is interesting. I also enjoy learning about how how the activation of different pathways illicit different responses in the body. Besides being fascinated by the project, I was also impressed with the quality Alina’s talk. It was apparent that she had thoroughly rehearsed her talk and she enjoyed what she was doing. I cannot wait to see the results for her project at the end program. Overall, everyone gave an amazing chalk talk. Even though we have four more weeks until we present our results (we hit the halfway point!! ), I am excited to see how everyone’s projects turn out. As mentioned in my previous post, this summer I have been given the opportunity to work in the Hammer lab within the Department of Immunology. The lab is run by Dr. Gianna Hammer and I had the pleasure to interview her this past week. Before I started the fellowship, I had the opportunity to read about her research and her amazing accomplishments, which include being named a Pew Scholar in 2015. I remember being excited to work with such a talented individual, which is why I was excited to have the opportunity talk to her about her research endeavors. Dr. Hammer went to Eastern Washington University for undergrad and received her Ph.D. from UC Berkley. She, at first, was interested in microbiology but switched her focus to immunology after taking a class in the subject. She liked how immunology was relevant to the discoveries going on. During her academic studies, people were starting to realize that the bacteria in the body had critical functions. The science is what lead her to the intestines. Throughout her research, she kept questioning all the results she obtained. The questions that she asked in her research led her to investigate the role of the immune system in the intestines. During our interview, I asked Dr. Hammer what her most memorable experience has been thus far. The experience happened to be when she wrote her first manuscript while in graduate school. She wanted her PI to check over every section of the paper as completed them but they refused to read it until it was complete. When her PI finally read the paper, he had many critiques, but this process ended up being transformative. Dr. Hammer was able to learn the most compelling ways to present research to an audience and how to precisely explain data/results. The tools gained while writing this paper have stuck with her throughout her career. One of my goals, as mentioned in my first blog post, is to learn what to do after failure. I asked Dr. Hammer “How do you overcome/embrace failure in the research field”. She responded by saying “Failure comes in many forms”. Failure could be an experiment that did not go the way you expected or being rejected for a grant. She said that disappointment comes but its important to keep an open mind. Sometimes the failed experiment allows you to focus on a different aspect of a topic. Dr. Hammer also said to talk to the science with other people because sometimes they will notice something that you didn’t. Since I am new to research, I asked Dr. Hammer if she had any advice for students like me. The first thing she told me was not to be afraid to diversify. Try out different aspects and types of research. She also said to pursue research because it’s what you love. Research does not always produce rewards immediately, it can take years before the benefits appear. If you do not love what you are doing, then this work can become miserable. Interviewing anyone who has had success in a field that you’re interested in is always such an eye-opening experience. I am beyond thankful for the chance to talk to Dr. Hammer about her experiences in research. Week 2 of working in a lab is over and so far, it’s been a wonderful experience. Everyday I’m learning something new, which is always exciting. As mentioned before, I am working in the Department of Immunology in Hammer Lab. This lab specializes in looking at the role of the immune system in the intestines. I will be joining onto a research project that involves dendritic cells. In the intestines, you will find T-cells and B-cells, but you will also find mononuclear phagocytes (cells that engulf other cells) including macrophages (Mϕs) and dendritic cells (DCs). Both DCs and Mϕs are need for induction of active immunity in the intestines. Macrophages secrete cytokines. Even though both cells perform phagocytosis, Mϕs are better at it and frequently engulf bacteria/remove dead molecules in the intestines. Dendritic cells prime naïve T-cells and can prime T-reg cells. Unlike Mϕs, DCs can migrate between the intestines and lymph nodes. Both dendritic cells and macrophages share some surface markers. For example, both cells have MHC II (Major Histocompatibility Complex, Class II) protein markers. Each of these mononuclear phagocytes also have their own set of markers to differentiate the two cells. Mϕs have the markers CD14 and CD64. DCs have CD24 and CD26. While performing flow cytometry (using a laser to count/sort cells based on programmable differences), a population of DCs that were CD14+ was discovered in the colon. CD14 is usually a marker found on Mϕs. The lab is currently trying to learn more about this population of DCs. The specific question that I will be working to answer this summer is “How does the ability of CD14+ DCs to do phagocytosis compare to not only that of the Mϕs and the ability of the other 3 populations of DCs?”. We hypothesize that the CD14+ DCs will be able to do phagocytosis just as well as the Mϕs. I am excited to continue working on this project and to see the results we get back. 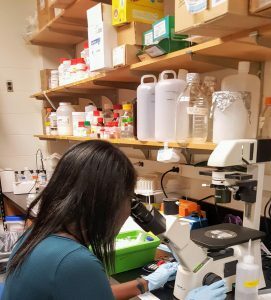 Being at Duke as opened me up to a plethora new and exciting experiences, one of these opportunities being the Biological Sciences Undergraduate Research Fellowship. For the summer, I will be working within the Department of Immunology, specifically in the Hammer Lab. This will be my first experience in a laboratory. During the program, I hope develop knowledge about working within a lab, but to also learn about myself in the process. Over the course of the summer, I hope to learn whether or not research is for me. Ever since I was in high school, I wanted to pursue a career in research. I felt that doing research would be the best way for me to use my skills to make a difference in the world. During this summer, I will be assisting my mentor with her research project, giving me plenty of hands-on experience within this field. Working in a lab everyday is the perfect way to figure out if this is something that I would to continue to pursue. Working in the lab this summer will also teach me how to ask questions. There are times where it can be intimidating to ask a question, whether it be to the other people in the lab or to yourself. Asking questions is the key to gaining new knowledge and growing intellectually. I hope that while I work in this lab, I will become more comfortable with asking questions about things I do not understand. Hopefully, this will not only make me a better research scientist now but prepare me for future success. As mentioned by one of the other BSURFers in our opening breakfast, working in a lab can show you what it is like to fail and what to do after failing. I had never really considered this idea beforehand but it is something that I would like to learn. Not every experiment will go the way you expect it to. Your research will not always point to the conclusion that you expected it to. The question is what do you do afterwards? What further questions do researchers ask? It will be interesting to see how these questions will be answered within the lab. This summer will be full of ups and downs, but I am excited to see where it will take me. I look forward to meeting and working with talented individuals during this program. I am ready to dive into the world of research! Cells, Cells, and More Cells.